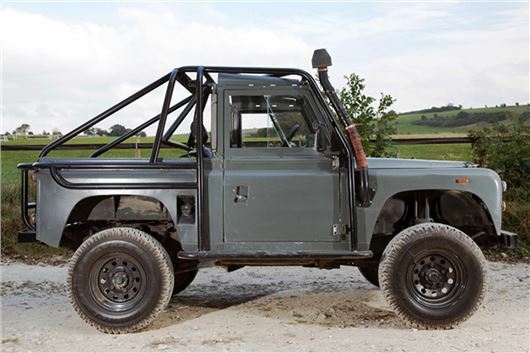 I recently had my Land Rover Defender 90 TD5 serviced and MOTd at my regular 4x4 garage. The vehicle was running really well with no issues to report. They replaced a corroded fuel filter housing and then experienced problems with the fuel pump. A new pump was fitted and I collected the car. I immediately had starting problems, the fuel pump whining like mad as the engine turned over. The garage suggested the injector washers may be worn and replaced them. This made no difference, so it was felt the new fuel pump was at fault and another new pump was fitted. I collected the car again and filled the tank with fuel, which seemed to make a huge difference, no noise whatsoever from the pump. However once the fuel was down to a quarter of a tank, the pump started whining again, with starting problems. I reported this to the garage but had to fill up meanwhile and as before the pump was quiet and started well. I have paid a large bill so far, but have a promise that they will sort this out for me, but from the symptoms, can you suggest what could be at fault. What they fitted was a 'low pressure fuel tank lifter pump'. If it starts whining when the tank is 1/4 full, that suggests that its pick-up is not located deep enough in the tank, so the fuel pump is sucking up air and that's why it whines and that's also why the engine won't start. I'd guess that in fitting the fuel filter housing they created an airlock in the fuel line and that's the real reason for the subsequent starting difficulties. It might not have needed a new low-pressure fuel tank lifter pump at all. I would like to check on the responsibility of a trader from whom I bought his wife's car, please? The 2005 Mercedes CLK350 was advertised in Autotrader by a trader. When I looked to see 'other cars by same trader' I only found a couple of small vehicles, so when I called up I asked whether he normally traded high-end cars. He said that he had a number including BMW, MINI, Audi, etc and when I visited there were around a dozen such vehicles on the drive of his home. I therefore was encouraged to know he was not just a minor trader, and that he gave warranties, etc. He told me the car was his wife's, which they bought from new with a good number of extras. Road-testing the car, I found it smooth. The brakes, steering, and general condition much better than previous CLKs I had tried. The service book was all stamped up. I bought the car, paying by transfer to his wife's account to 'save him transferring it later'. The day after collection I realised I had no warranty and texted to ask for it. He replied that, as it was his wife's, he could not give a warranty, to which I responded that I could not see any reason for the difference. What did it matter whose car it had been? This was overtaken by events three days later when there was no life in the battery, and the driver's door lock did not respond to the skeleton key. I got in using the wire clothes hanger method and the RAC replaced the battery and it started first try. However, when I drove it next day, the rear lights were all mixed up, wrong bulb flashing as indicator, etc. I took it to my loyal Mercedes specialist who has serviced my MBs for many years and he used the Star system showing the SAM board in the boot was faulty. Also, he said, it showed the balancer shaft was faulty, which he suspected as soon as he drove it: apparently a common fault with this model, resulting in imbalanced cams. The trader says that if it was a car he sold through his company there would be no questions as to his taking responsibility and covering costs, etc., but as it had been his wife's car he has no responsibility. He seemed very knowledgeable about the balancer shaft issue and it being a common problem, and he says the car was on a special charger over the winter and no starting problems. I paid £7,900 for the car; almost £500 for electrical repairs and a few pence short of £2,000 for the balancer shaft and associated work, all by specialists, and am hoping I would at least get some redress from the trader, but he is refusing as sold as wife's car and so no responsibility. I hoped you might have some advice as to whether worth my trying further for some money from him. Together with articles from other motoring magazines, you have commented on DSG VW gearboxes in recent weeks and stated that there are 2 types: wet clutch and dry clutch. Some articles have hinted that the dry clutch can give problems. I therefore have the following questions: What is the difference between the two? Obviously, the dry clutch cannot be entirely 'dry' and must have lubrication. Is it true that the dry clutch is less reliable? What faults can occur? Which clutch is fitted to my 2017 SEAT Leon TSI 150 PS FR Technology 1.4 petrol Estate? The DQ200 is a seven speed DSG with a dry clutch this is used in all five brands. The gearbox code in the diagnostic log shows 0AM and or 0CW. This gearbox does not have a service requirement as it is sealed for life. Fittted to 1.0 litre to 1.8 litre petrol and diesel engines. This is the type fitted to your car and is the one that has had all the trouble. This was partly due to pre-2012 DQ200s being originally filled with 'longlife' synthetic oil that became conductive at high temperatures, knocking out the Mechatronics; partly due to the Mechatronics failing anyway; and partly (but more rarely) due to the dry clutch packs failing. On similar dry clutch Ford Powershifts, the problem has been with the clutch packs. Many independents believe that the mineral oil substituted for the synthetic oil in the DQ200 needs to be changed every 40,000 miles. DQ400 is a six speed DSG with a wet clutch and is used in the VW Golf Hybrid and Passat GTE and also Audi A3 e-tron. The gearbox code in the diagnostic log shows 0DD. The gearbox also has a service requirement of 40.000 miles. DQ250 is a six speed DSG with a wet clutch. The gearbox code in the diagnostic log shows 02E and or 0D9. This also has a service requirement of 40,000 miles. Fitted to 2.0 litre petrol and diesel engines. DQ500 is a seven speed DSG with a wet clutch and is mainly used in the VW Tiguan and Audi Q3 it can also be found in the CV T5. The gearbox code in the diagnostic log shows 0BH and or 0BT. This also has a service requirement of 40,000 miles. Fitted to 2.0 litre 4-cylinder petrol and diesel engines and 2.5 litre 5-cylinder petrol engines. You discussed the possibility of including a Ford Focus Ecoboost as one of the cars to be considered. Your comment was “forget the Ford Ecoboost: too many clutch failures”. Is this a common problem with the Focus, or does it apply to only certain models? If it is the latter, which ones are a problem? I have found a 1998 Jaguar XK8 convertible at a garage in Hampshire with 34,000 miles and a price of £13,750. From the service record, the mileage looks genuine and the condition is very good outside and inside. The price seems high to me for a car nearly 20 years old, but I cannot find an online valuation for this registration. The numberplate was changed some years ago, but I didn't take a note of the original number. The car is metallic blue with cream leather upholstery. The electric hood is in good order and works. What should I pay for a car like this, please? The ride was very bumpy along country roads, which my own car glides over. Was this right? Are there any serious problems that can occur on XK8s and anything to look out for now? Is it unwise to buy a 20-year old car? I intended buying one of the last of that shape, about 2005. Is the car a good investment and will it appreciate in value? Would it be better serviced by a Jaguar dealer or by an independent garage, and what are the likely servicing costs, please? I've been looking for a few months and I really liked this car. I'm afraid colour comes into it. I'd be extremely grateful for some knowledgeable advice as I'm a novice with a car like this, despite my 61 years. I want a convertible XK8 for a bit of fun; I shall keep my present car as my workhorse. I do hope you can help. I'm emailing on behalf of my father-in law (he doesn't know how to use the Internet). "I'm looking to buy a small automatic car. Is a Vauxhall Corsa or Viva reliable? If not, which make would you recommend? The Viva is not available as an automatic. The 'Easytronic' automated manual available on the Corsa 1.2 is not recommended. Better a KIA Picanto 1.25 4-speed torque converter auto, or a Hyundai i10 1.25 4-speed torque converter auto. Avoid dry clutch DSGs and Powershifts. I’m writing to see whether you would be interested in working on a piece to ‘out’ Volkswagen in relation to its UK 'fix' to the diesel emissions scandal, which has left my car completely unreliable? My recent experiences have ensured I’ve completely lost faith in the company, whose sub-standard response to the scandal, ‘closed door’ policies, and infuriating customer ‘service’ have left me feeling silenced, angry, frustrated, and short-changed. I own a 2011 VW Golf Plus Bluemotion, which I bought nearly-new as an ex-demonstrator. I chose this car specifically because it was advertised as having a smaller environmental impact than alternatives. I was also very attached to the brand, having driven only VW Group cars since 2001. Before the emissions fix, my car had given me close to six years of trouble-free motoring. Living in London, I tend to drive only for longer journeys such as holidays, visiting family, or taking my children to events. As a result, the car has only 30,000 miles on the clock, even after six years. It is well looked-after, with a full VW dealer service history. As you may be aware, in response to the diesel emissions scandal, VW recalled a range of diesel vehicles in the UK for the application of a fix that would supposedly reduce NOx emissions to an acceptable level with no impact on performance or reliability. Following VW UK's instruction, I had this work done on my car at my local VW dealer alongside its annual service and MOT at the end of February. In mid-May, on one of the first journeys I took following the emissions fix, my car broke down completely on the M4 outside Bristol. This left me stranded by the side of the motorway for hours with my young son and his friend. We returned to London with the car on a recovery truck. My local dealer identified the problem as a broken fuel injector. I was happy that they replaced this free of charge, but was struck by their willingness to do so, raising questions in my mind about the long-term impact of the emissions fix work on my car. At the end of July, following only a handful of journeys since May, my car broke down in an almost-identical way (substantial loss of power and flashing warnings on the dash to say 'stop engine immediately and return vehicle to workshop'). This time I was on the M6 in Staffordshire on the first leg of a camping holiday. Not wanting to stop at the side of the motorway with my son and his younger sister in the car, I managed to limp on to a safe spot. As it was a Sunday lunchtime and no VW dealerships were open to potentially provide a courtesy car, I had to hire another car to be able to continue our holiday. We loaded all of our camping gear into the hire car and I again had our car recovered to West London Volkswagen for repair. They identified the problem as a broken EGR valve, and have replaced this. As with the previous breakdown, my understanding is that they won't charge me for the work. I am conscious that both parts that have failed in the few months following the emissions fix work are listed in a letter I received from VW UK in mid-July. This letter notes that if any of a number of parts fail in the 24 months following the emissions fix, VW UK will consider the complaint very carefully and may repair the problem free of charge as an act of goodwill. While I'm pleased not to be out of pocket for the repairs, the letter and my experience with the breakdowns together suggest to me that there are systematic problems with the emissions fix and that it doesn't live up to VW's claim that it will have no effect on performance or reliability. At this point, I've completely lost confidence in my car. It's not much use to me if it dumps me, and my young family, on the side of the motorway far from home every time that we go camping or visit family. For this reason, I've left it in the dealer's hands while I talk to VW UK. I've shared my concerns with VW UK and asked them to buy the car back from me at a price that reflects its underlying value or to exchange it for a suitable non-diesel alternative vehicle, and to provide compensation for the substantial inconvenience caused. These feel to me like reasonable actions to take if they stand by the quality of the emissions fix work. Further, my request is entirely in line with the way VW has treated US customers affected by the scandal. Nonetheless, they have refused outright to discuss either approach and have not responded to my request for any other solution that doesn't involve my taking back this car. I've also asked VW UK to cover the cost of the car I was forced to hire to continue my holiday earlier this month. They have so far been very non-committal on this point and have let me know that any payment would depend o further investigations. As VW UK is not willing to talk to me further about my experience, I hope you'll be willing to investigate further and perhaps to take up with them directly. I'd be delighted to discuss the story in more detail if helpful. As I have now explained to readers literally thousands of times, I had a meeting with VW engineers and lawyers in a Heathrow hotel to fully understand the nature of the fix, and have published scores of times my suggestions of how VW should deal with pre-fix and post-fix injector and EGR problems. Basically, reducing NOx output from a diesel engine involves increasing the output of soot. To reduce this soot, without affecting performance or fuel economy, the injection sequence of the engine is significantly remapped to include an additional cycle. But if the engine is old and the injectors are worn this doesn't always work. So some of the injectors may need to be replaced. Furthermore, the 1.6TDI engine has always had a propensity for EGR failure, which is why long before the NOx emission issue arose, I had frequently suggested that VAG should replace these EGRs free of charge. It is now doing exactly that, as well as replacing worn injectors. That is (finally) fair and reasonable. It was an uphill struggle against the German accountants, but as long as VAG does this I will not support any further pursuit of VAG for compensation claims. The situation in the USA is different because the NOx limits there are lower and cars could not be modified to meet them so VW had to buy the cars back. Early retirement beckons at the end of the year and so my company Ford Focus estate will be going. I need to replace it with something that will accommodate all the camping gear we have and be suitable for touring. There's a huge choice of vehicles and, after spending 40k miles a year on the road, I've had a good chance to see what I like the look of. Models I've considered are: Ford Focus estate (I know size is ok); Or, for a bit more space, a VW Passat estate; a Hyundai i40 estate (my daughter has one); Skoda Octavia estate; KIA Sportage as the odd choice. Or you may suggest something completely different. Budget is £10,000-£12,000. A Skoda Octavia or SEAT Leon estate make sense with the 1.4TSI engine. You could go for a KIA cee'd or Hyundai i30 SW with the 1.6GDI engine and benefit from balance of 7-year or 5-year warranty. Passats are good but until a few months ago were only available with diesel engines and a diesel is no good for short runs and a small annual mileage. A Peugeot 308 1.2 Puretech 130 estate is also good, and finally the Honda Civic 1.8iVTEC Sport Tourer: ugly, but effective. What's your opinion on Spanish property, like maybe Sevilla? I was told by an impartial party that it holds its value and goes up, in Sevilla, that is. I love Spain. If I had the choice of any country in the World in which to live I would choose Spain. I love the wine. I love the food. I love the sunshine. I love the people. And I love watching bullfights, which you'd better get used to if you're thinking Sevilla. If buying a property you need both a 'Notario' (solicitor) and an 'assessor' (who usually works for the notario). A good assesor sorts out all of the multiple problems you would otherwise have. The biggest problem of buying property in Spain is that debts incurred by previous owners stick to the property and this can be a total nightmare. Buy a house and generations worth of debts could come out of the woodwork. Plus family disputes over which members were left what. You could find that one sister owns the bathroom. Another brother owns the staircase. Been there. Done that. You need all the help you can get. The other thing to be aware of is tax on the difference between the 'declared value' when the vendor bought the house and the price you are paying. In Spain it used to be common to under-declare the 'declared value' to reduce tax on the purchase. But the authorities started catching up with this and no longer allow a purchase price to be under-declared. So if you buy a house for 500,000 Euros, but its 'declared value' when the vendor bought it was 25,000 Euros, you would have to pay tax on 475,000 Euros. Be very wary of buying older houses that the vendor has lived in for 20 years or more. a) How many people are so naive to believe both showroom sales staff and politicians and buy diesel cars for mileages not just under 20k miles a year, but WELL UNDER 10k. b) Ditto for people, even now, who continue to buy what, in my opinion, has been demonstrated to be wholy unreliable (design faults that can't be fixed or which require significant investment in ongoing extra maintenance to keep going) dual clutch 'dry' gearboxes. Given that a car is, for the vast majority of us, the second most (and for those only renting a home) expensive purchase outside of a home that we will ever make, why FOR THE LOVE OF ALL THAT IS HOLY do these (IMO) berks do absolutely zero research into their purchase/issue or write to HJ when (as he states in today's collumn and many times before) they could've easily searched for it on this (easy-to-navigate) website or the Telegraph (not so easy but possible), including in HJ's News and Car-by-Car Reviews section, where its as clear as day. I had a Rover 214Si (1996) which although it ran well had a final ECU problem, that convinced me to sell and buy a Rover 2.0 Diesel in 2002. The diesel didn't benefit from low Road Tax, but it did do 50+ mpg (once it got a new diesel fuel pump after Rover went phut), and ran for 140,000 miles till Jan 2013. My homework was done, to death (on prices, mpg, reliability etc) but without HJs website nor the Telegraph. So I bought a VW Golf, 1.6TDi, 15 months old, under 10k on the clock (ex hire car I believe). The Salesman did ask me what mileage I intended doing, approx. 12,000 per year, at the time and 25 mile *2 trips a day to and from work, so I can't say he didn't warn me about low mileage usage. There was of course, no mention of DPF and EGR problems, perhaps a bit early for them to have surfaced on that car (?). Road Tax was now only £30/year and a full tank of diesel got me 700 miles, so what wasn't to like? Of course, the new Diesel was bound to be cleaner that my old Rover, so what not to like there either, doing my wee bit for the Planet as well. My circumstances have changed, no longer at work and commuting, but still managing just about 30k in last 3 years "touring". I've cut out 75% or more of journeys under two miles into Town & back, walking instead. I've even been running on BP Ultimate since June..! Do you suggest that after I've maintained the Car with all services, done on time, replaced all Timing belts etc at 5 years that I should chuck the car away, have I made some horrendous mistake that anyone could forsee, or have events outside my control taken over? I don't have £s to throw away, should I cut my losses and go back to Petrol now, or run this car to it's natural end whilst the Powers That Be sort themselves out, but not at my expense?